5650 Imhoff Dr, Ste H. in Concord, CA. We are near the intersection of Interstate 680 and State Route 4, at the Solano Way Exit from State Route 4. Continue right from the Solano Way off ramp onto Arnold Industrial PLACE. At the traffic light, turn right onto Solano Way and pass under the freeway, then turn left at the traffic light, onto Imhoff Drive (the street sign will show Arnold Industrial Way to the right). Turn left at the end of the Solano Way off ramp (traffic light) onto Arnold Industrial WAY. Continue straight at the Solano Way traffic light. Arnold Industrial way becomes Imhoff Drive. 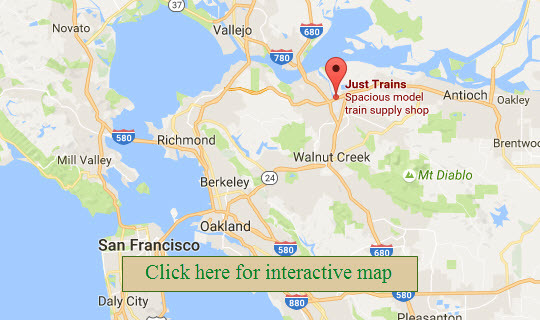 You can click on the map image to open a new interactive map window. When arriving from the intersection of Solano Way & Imhoff Drive, our store in in the business park on the left. Imhoff Drive is a divided road, at the end of the road divider, be ready to turn left into our parking lot driveway, then right. If you wait to see the store, or for your GPS to say "you've arrived", you will have gone past the driveway and need to make a "U" turn. There is Arnold Industrial Way, Place and Court, all nearby, but all different. Unlike a rose, a street by any other name is not as sweet. If the street sign says Arnold Industrial Place or Court, you are on the opposite side of State Route 4 from the store. Arnold Industrial WAY, becomes Imhoff Drive when it crosses Solano Way. Some GPS systems, mis-locate our address on the wrong side of Walnut Creek (the body of water, not the city). If your GPS says "you've arrived" and you find yourself staring at a vacant field, you are close, look for large white oil storage tanks across the creek, we are located across the street from the tanks. Bay Area traffic can be bad, if you are coming for visit on a weekday afternoon, you may want to check out these Alternate Routes that your GPS may not tell you about. Don't want to put up with Bay Area Traffic, here is how to take Public Transportation to come for a visit.